Submerged is like a sitcom "bottle episode," except the bottle is a limousine and the limousine is trapped underwater. How's that for a hook? I'm a big fan of Steven C. Miller, a director who works primarily in low-budget genre films but who really knows how to put a movie together. After getting his start with the massive zombie epic Automaton Transfusion made for only $30,000, Miller has been turning out carefully constructed, beautifully photographed films that stand out from their indie movie brethren with artful slickness and supreme confidence. His latest, Submerged, is a claustrophobic action thriller starring Jonathan Bennett as Matt, a driver/security guy for a shady businessman/gangster (Tim Daly) who just happens to have a very beautiful daughter named Jessie (Talulah Riley) he wants protected. While driving her and her friends back from a club one night, Matt's limo comes under attack and is driven off the road into the river, slowly sinking to the bottom with Matt, Jessie and her friends must find out a) who's trying to kill them and b) try to get out of the limo before they all drown. Maybe not in that order. We've seen our share of "bottle" movies in recent years, with characters spending entire films trapped in phone booths and ATMs and coffins and cars both on the road and overturned. 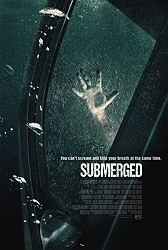 The screenplay for Submerged (by Scott Milam, who also wrote the underrated Mother's Day remake) is smart not to confine the entire story to the back of the limo, opening it up for the first and third acts to provide some Lost-style backstory and resolution. It's not that Miller couldn't have handled the demands of maintaining the single location for the entirety of the running time -- I have every confidence that he could -- but the characters trapped in the back are too shrill and unlikable for us to want to spend that much time in their company. Bennett establishes sympathy early on (in part thanks to the backstory he's given), but he's really the only one worth caring about in the limo. The final act is particularly problematic, as the movie shifts gears and becomes much more of a conventional thriller complete with surprise revelations and lots of characters explaining things. Up to this point, Submerged was a tight, idiosyncratic little thriller made with enough skill and artistry (Miller continues the style he really began in Silent Night in which he saturates his frames in bold colors) to exceed any limitations place upon it. The last third, though, feels too much like any number of DTV thrillers and cheapens some of what came before. While I'm not crazy about that last act, it's not enough to completely derail what Miller accomplishes in yet another movie. He continues to prove that he's able to take fairly thin genre material, make it look great and move effortlessly, creating something that shouldn't work but is surprisingly good (see also his "more violent Home Alone" [the great The Aggression Scale] and a remake of Silent Night Deadly Night). After this many movies, it really shouldn't be a surprise any more. Plus, Bennett cuts a decent action figure -- pay close attention to his John Wick shooting style -- Mario Van Peebles lends some cool in a small supporting role and Rosa Salazar, so good in this year's little-seen festival player Night Owls, creates some authentic terror in the back of the limo. There are pieces that work better than others, but it's Miller's skillful artistry that holds it all together. I'm not the only one who has noticed, either. According to his IMDb profile, Miller has a Bruce Willis movie already shot (Extraction), one Bruce Willis movie currently shooting (Marauders) and two more Bruce Willis-less films already in pre-production (and yes, I know that it's IMDb and these "pre-production" designations could very well be meaningless). I'm excited to see Miller step up to the next level and hopefully get larger budgets and greater resources. After all, if he can make a $1 million movie look like a $10 million movie, imagine what he can do with $10 million? Give Steven C. Miller a Star Wars movie already. I started this the night you recommended it but fell ill and only got about 20 minutes in, fell asleep and remained in bed the rest of the weekend. I'm gonna finish it soon. I have not seen Automaton Transfusion but it's been on my radar so I'll bump it up. I've seen Aggression Scale and Silent Night and liked both. I also saw Under the Bed and don't remember it very well but I do remember not really liking it. I don't know that I liked this as much as either Aggression Scale or Silent Night, but it's still a strong piece of direction. And I don't know if my DVD of Automaton Transfusion is terrible or if it's a stylistic choice, but the photography is smeary to the point of being almost unwatchable. The scale is what impressed me most about it. Just watched Submerged. I envy your enthusiasm for it ;) I was feeling the tension until the 3rd act as you point out where the film just turns into a simple claustrophobic thriller. Even though I appreciated the pace and structure, I was constantly annoyed by the characters and the narrative structure which seemed really forced from the jump. The film does look damn good throughout though and you are dead on regarding Miller making something out of nothing although I expected it to look great based on what I have seen. I loved the scene where our "hero" takes control and we find out what was what. There's a neat kinda "Predator 2" lighting vibe going on in the Limo though I have no idea if that was an aesthetic choice or an actual homage to "red and blue" lighting. Still, I found it underwhelming mainly due to the dialogue and acting of terribly unlikable characters and an awful score and sound design (sorry to say; underwater Limo - should have been great) which made this a mediocre experience for me. Keep em coming as always. I know I sure ain't batting .500!